The Eco-Management and Audit Scheme (EMAS) was developed by the European Commission to help organisations evaluate, report and improve their environment performance. Paul Clarke reports. With the exception of problems involving the free movement of workers, the argument most frequently used against the EU during the fractious Brexit debate has been that it undermines national sovereignty and tries to bind the Member States into an ever-more integrated, supra-national unit. The European Commission has always responded with reference to “subsidiarity”. This bit of EU jargon basically means that, while decisions should be taken as closely as possible to the local level, action should be pursued at EU level where it is possible to achieve more than individual countries acting independently. The best example of where this concept has most value, the Commission argues, is the environment — given that problems such as air and water pollution, global warming and waste disposal do not respect national borders. Three distinct strands can be identified when it comes to the EU taking action to ensure that all its members are playing to the same rules, with the first and most obvious being legislation. In the 27 years since the SEA gave it a legal foundation to adopt laws in this area, it has produced dozens of environmental directives with pollution and waste alone seeing legislation on landfill, integrated pollution prevention and control (IPPC), batteries, hazardous waste (and its import and export), packaging, electrical waste and industrial emissions. Other significant legal advances include work on habitats, greenhouse gas emissions, environmental impact assessments and endangered species. The least obvious of the three strands is the one on which this article will concentrate. With the first two focusing on action at the European level, this concerns the attempt by the Commission to ensure that subsidiarity works both ways — so that decisions that can better be accomplished at a regional or local level are taken there and the widest possible involvement in environmental management is ensured. Set out in EC Regulation 1221/2009, it concerns the voluntary participation by organisations in the EMAS Regulation. From the beginning, the Commission made the case that excellence in environmental performance offers a strong business advantage, which is why environmental management systems are used worldwide by companies and organisations of all sizes and types. “With EMAS,” it advised businesses, “you find answers to three of today’s key management challenges which organisations of all types face: resource efficiency; climate change: and corporate social responsibility”. Furthermore, it continued, EMAS strengthens an organisation’s ability to cope with risks and to identify opportunities by implementing systematic environmental management processes and structures. Given the distinctive features of EMAS — such as environmental disclosure through the environmental statement or the application of Key Performance Indicators (KPIs) — organisations are helped to successfully navigate through complex sustainability challenges. As is often the case with EU legislation, the practical details are contained in the seven annexes to the relevant regulation. These cover the following. The environmental review (the first step of an EMAS registration is to identify all significant environmental impacts through a review). Environmental management system requirements and additional issues which must be addressed by organisations implementing EMAS. 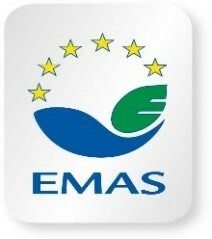 Use of the EMAS logo. The environmental verifier’s declaration on verification and validation activities. Several of these annexes were expanded in 2017 by EU Regulation 2017/1505 and an amended version of the full text published. Most recently, in December 2018, Annex 4 on Environmental Reporting was updated by EU Regulation 2018/2026. This takes account of improvements identified in the light of experience gained in the operation of EMAS. Both EMAS and ISO 14001 have the common objective of providing good environmental management. Since the revision of the annexes of the EMAS Regulation, it is easier for an organisation already complying with an environmental management system such as ISO 14001 to step up to EMAS. And the Commission makes it clear that it is indeed a step up. 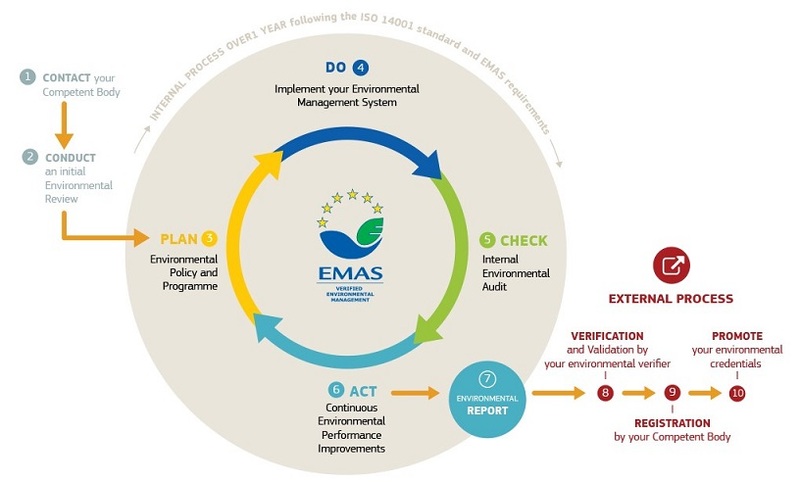 While the ISO 14001:2015 environmental management system requirements are an integral part of EMAS, the Commission argues that the EU initiative is the more credible and robust environmental management instrument available. By contrast with ISO 14001, for example, EMAS provides registered organisations with the following six performance indicators. strong employee involvement and greater team-building capacity. The final section of this article will examine the advantages of this final claim (which is not a requirement of ISO 14001). Having brought environmental management down to the level of the individual organisation, can EMAS actually take the subsidiarity principle as far as involvement by individual employees? The amended annexes referred to above certainly make it clear that the process of implementation of EMAS should include involving the organisation’s workers as this increases job satisfaction and knowledge of environmental issues. The various regulations accordingly call for active involvement of employees and their appropriate training. “Employee involvement” in this context should be understood as including both direct employee participation and the provision of information to employees and their representatives. This requires an employee participation scheme at all levels as well as management regularly providing appropriate feedback to employees. the preparation of the environmental statements. Appropriate forms of participation such as the use of suggestion books, project-based works or environmental committees can be used to improve the level of employee engagement with EMAS. The Commission offers as an example the UK Environment Agency, which urged its staff to think up ways to reduce its carbon footprint. Employees then came up with the idea of using methanol fuel cells to power the agency's fish counting equipment. Since the batteries no longer need to be changed so frequently, this saved 1.5 tonnes of carbon dioxide (CO2) per year per fuel cell, totalling more than 50 tonnes of CO2 every year. The cells paid for themselves within six months, while the agency saves travel costs related to the replacement of batteries. One approach to employee involvement is through the use of Green Teams. As with all aspects of EMAS, this should be voluntary and should seek to involve a broad cross-section of the organisation, focusing on people with a good knowledge of its operations, a willingness to learn and a commitment to continual improvement. To fulfil their role effectively, the members of the team must be given the authority to pursue implementation of the EMAS process and must be able to propose new ways of working that benefit the environment, the company and its people. One of the first and core activities of the Green Team can be performing the environmental review that will help identify the company’s current level of environmental performance. The team could also prepare a simple, anonymous environmental survey to assess employees’ behaviours regarding different environmental topics (waste management, energy, mobility, internal communication, etc), as well as their willingness to adopt more sustainable behaviours. Suggestions that come from the staff, the Commission notes, may, once implemented, be more suitable for the reality of the company, and hence find greater acceptance among staff, than top-down decisions coming from the management. Under the new requirements of the EMAS Regulation, roles and responsibilities need to be clearly defined and communicated. Online tools have been developed to support the implementation of EMAS, together with an instruction manual. Tool 3 allows responsibilities to be assigned when starting EMAS through the Responsible, Accountable, Consulted, Inform, Support (RACIS) Matrix. It is estimated that this exercise can be done in a Green Team workshop in around an hour and a half, with small groups of three to four people each working on one part of the matrix. The European Trade Union Confederation (ETUC) has put forward more ideas on worker involvement in its Green Workplaces guide for union representatives. In the UK, the TUC argues that union involvement will strengthen an environmental management system and can form an important part of the evidence employers use to gain accreditation. It has produced a similar guide to that published by its European colleagues (Go Green at Work). This recommends a joint union-management committee to provide the necessary oversight, structure, and mechanism for staff involvement. Since the revision of its annexes, EMAS has invited organisations to identify the interested parties that are relevant to the environmental management system. It requires organisations to list these parties’ relevant needs and expectations and to identify which of these it expects or wants to fulfil. Employees clearly fall into this category, which means that organisations have to assess their staff’s environmental performance expectations. If they are directly involved in the definition and implementation of measures, their needs are more likely to be satisfied. In its assessment of employee involvement in EMAS, the Commission also suggests that it represents an easy way to boost happiness at work. People gain a stronger feeling of belonging to the company, higher job satisfaction and a higher level of motivation, it suggests, and environmental education actions (such as awareness-raising and training) give employees new motivation and feed their personal development. With a nod to the bottom line, it points out that happier and more committed employees can reduce absenteeism and tend to be more productive.